What are the ultimate motives that instigate individuals’ behaviours? What are the aims of social perception? How can an individuals’ behaviour be described both from the perspective of the actor and from the perspective of an observer? These are the basic questions that this book addresses using its proposed agency-communion framework. Agency (competence, assertiveness) refers to existence of an organism as an individual, to "getting ahead" and to individual goal-pursuit; communion (warmth, morality) refers to participation of an individual in a larger organism, to "getting along" and to forming bonds. 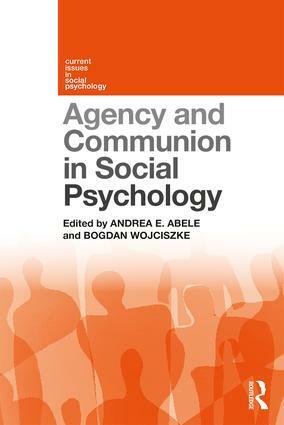 Each chapter is written by experts in the field and use the agency-communion framework to explore a wide variety of topics, such as stereotypes, self-esteem, personality, power, and politics. The reader will profit from the deep insights given by leading researchers. The variety of theoretical approaches and empirical contributions shows that the parsimonious and simple structure of two types of content in behavior, motives, personality, self-concept, stereotypes, and more to build an overarching frame to different phenomena studied in psychology.